Islands of millet in a garden surrounded by water from rain or flooded swamp in the rainy season in October, with the roof of a homestead visible on the skyline. These islands were made both to protect the millet plants from rotting and to irrigate the garden and provide roots with essential moisture. Evans-Pritchard spent about seven weeks in total in western Nuerland during Oct-Nov 1936, mostly at Nyueny village among the Nuer Leek. The Rengyan tribe lived to the west of the Nile in western Nuerland, and were northern neighbours of the Dok. Note on print reverse ms pencil - "W. Nuer 5992 02 7 [numerous printer's marks]" & print front border ms ink - "NUER I/36"
Morton, Chris. 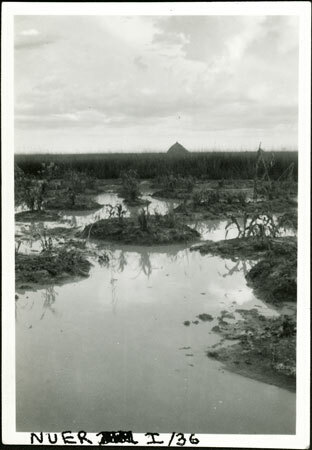 "Flooded garden in Nuerland" Southern Sudan Project (in development). 03 Jan. 2006. Pitt Rivers Museum. <http://southernsudan.prm.ox.ac.uk/details/1998.355.18.2/>.